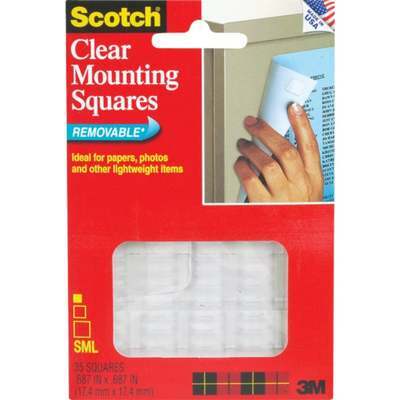 Clear removable double stick mounting squares. Holds securely, removes cleanly and easily from most objects, reposition and re-stick. Ideal for papers, photos and other lightweight items. Won't stain walls. For use on metal glass, wood, plastic, and almost all smooth surfaces. Holds up to 1 lb. 35 squares, .68" x .68".